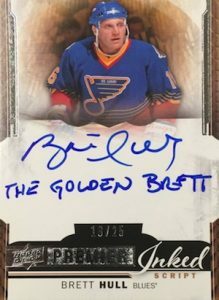 Back again following it's return to the hockey card lineup last season, 2015-16 Upper Deck Premier Hockey largely stays true to the hit-based format from 2014-15. Each hobby box includes five total hits, with one guaranteed to be a Rookie Auto Patch. Despite the focus on autographs and relics, there is still a traditional base set that includes rookie players. The 100-card set features 50 rookies and also adds a mix of premium parallels. These include base Jerseys, Silver Spectrum Autographs (#/49 or 25), Prime Materials (#/25 or 10), Brand Logo Swatches (#/6), Tags (#/3), and Platinum Blue Spectrum Autographs (1/1). 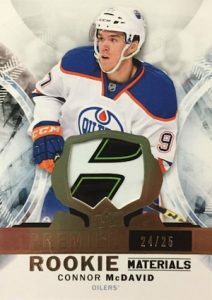 Rookie are also the focus of several other choices in 2015-16 Upper Deck Premier Hockey. Chiefly among these are Acetate Rookie Autograph Patches. The acetate stock cards offer a large patch and on-card autograph along with tiered rarity. In addition to the base versions (Tier 1 #/375; Tier 2 #/199), collectors can find Silver Spectrum (Tier 1 #/65; Tier 2 #/35), Gold Spectrum (Tier 1 #/15; Tier 2 #/10), and Platinum Blue Spectrum (1/1) parallels. Another rookie option removes the patch in the form of Rookie Autos that are each numbered to 399. Parallels include Silver Spectrum (#/65), Gold Spectrum (#/15), and Platinum Blue Spectrum (1/1). Also showcasing a rookie focus, the 2003-04 Rookie Autograph Patch Tribute (Tier 1 #/99; Tier 2 #/49) inserts honor the past designs and include a Gold (Tier 1 #/15; Tier 2 #/5) parallel. Displaying some of the most impressive relic pieces in the product, the hand numbered Mega Patches feature specific options like Chest Logos, Sleeve Numbers, Shoulder Logos and Commemorative Logos. There are also Mega Patch/Stick Duos (#/25) and Trios (#'d). 15-16 UD Premier COLTON PARAYKO Super Rookie Retro Patch Auto 51 99 SICK! 15-16 UD Premier NOAH HANIFIN Rookie Patch Auto 375 RPA ARP 3 Color Patch! PARALLEL CARDS: Jersey #/199 or #/99, Prime Materials #/25 or #/10, Brand Logo Patch #/6, Tag #/3. AUTOGRAPH PARALLEL CARDS: Silver Spectrum #/25, Platinum Blue Spectrum 1/1. 20 cards. Serial Numbered #/399. PARALLEL CARDS: Silver Spectrum #/65, Gold Spectrum #/15, Platinum Blue Spectrum 1/1. PARALLEL CARDS: Silver Spectrum #/65 or #/35, Gold Spectrum #/15 or #/10, Platinum Blue Spectrum 1/1. 27 cards. *Card #SRR-GO found only in parallel. PARALLEL CARDS: Gold #/15 or #/5. PARALLEL CARDS: Platinum Blue 1/1 (No card #AG,AO,EM,SC). PARALLEL CARDS: Silver Spectrum 1/1. *Cards #IN-AO, #PB, and #SC not included in parallel. PARALLEL CARDS: Shoulder Logo #/8 or less, Sleeve Numbers #/8 or less, Commemorative Logo #/4 or #/2. Most subjects not included in parallels. View specific options with the full spreadsheet. PARALLEL CARDS: Patch #/15 or #/5. 12 cards. Overall odds - 1:15 packs. *Card #PS-EM not included in parallel. 14 cards. Overall odds - 1:24 packs. *Cards #LPS-GL and #LPS-TL not included in parallel. 14 cards. Overall odds - 1:10 packs. 30 cards. Serial Numbered #/65. PARALLEL CARDS: Gold Spectrum #/15. 32 cards. Serial Numbered #/15. 50 cards. Overall odds - 1:1 packs. PARALLEL CARDS: Prime Materials #/10 (No card #23), Brand Logo Patch #/6, Tag #/3 (No card #19). 46 cards. Serial Numbered #/49. PARALLEL CARDS: Platinum Blue Spectrum 1/1. *Cards #R-10, #R-28, #R-31, and #R-50 not included in parallel. *Cards #SA-AO, #SA-JJ, and #SA-SC not included in parallel. *Cards #SC-EM, #GL, #ML, and #SC not included in parallel. 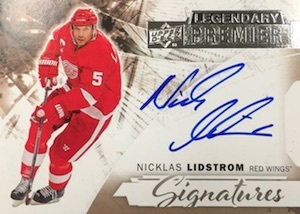 Overall 14-15 Premier Signatures - 1:82 packs. 5 Nit rating the set, rather I am rating your great job on the spread sheet checklist. Excellent. Thanks. broke 9 tins, best cards were domi acetate rookie auto to 199 and larkin gold rookie patch; bad part was domi was a redemption and larkin patch was single color. I am a collector so I like to keep the good cards I get when I break wax. however, the best cards are a redemption and a poor patch, so I will probably put everything I got on the bay. not very good for a product carrying this price per tin. big patches are best cards in the set however I think they increased the number for each player versus what they were last year. everything I got was hand numbered in the 20s. 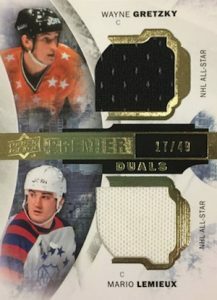 I watched many box breaks and this is again a one star product. Let’s say I would give it a 1.5 stars because I had the impression that it was SLIGHTLY better than Black and Ultimate, and the quality of the edges and corners is better too, but still…Same old things : poor players, monochromatic “patches” (see damone, the collector above me), no serial numbers for all the cards or very high serial numbers. I don’t expect 100% of the value, especially with High End products, and I know virtually that every High End product is a loss in terms of money, but with Black and Ultimate I had a big 75% of loses, which is unacceptable. I also understand that is very difficult to put a price on the pleasure of opening boxes and discovering the cards. In the end that’s why collectors collect. They expect to “lose” money, because this is not necessarily meant to be about making profit at any box break. At the same time, there must be an equilibrium. I’m convinced that even the most crazy collector loses his enthusiasm after paying a buck load of money and pulling only monochromatic patches, no name players and very high serial numbered cards, and perhaps here and there a Larkin. I cannot but congratulate myself for not buying this product, after the break boxes I saw. All in all, I will not rate it here because I didn’t purchase the product, but I only wanted to share my opinion about it. 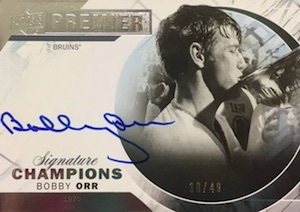 It was very hard not to buy into any breaks but after watching 20 case breaks on opening night, I come away from Premier a little jaded. I know when they are showcasing the product, before it releases, we are all going ga-ga over the pictures. However….watching the 1st 3 cards of each box break you see that negligible value. 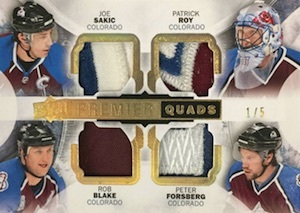 I loved Premier last year and I do love the design & look & feel of these cards but for a price point of $320+ (CDN)/box, PLEASE STOP USING TOILET PAPER PATCHES. Even if UD eliminated just the white patches, the cards would be so much better off. 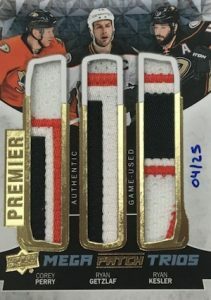 I understand costs, etc.. but high-end releases like Premier & CUP should NEVER have a single color patch. They should be 2 colors minimum. You want to give us single color patches? Then do it in the low-end products please. For those looking to hit the jackpot with Mickey Dee, the odds for hitting anything Edmonton related look pretty close to those odds in SPGU. I give UD credit for not trying to overload McD in this release to try & retain card value. It’s hard to hit him in Premier. Did anyone else notice how the online breakers seemed to have trouble filling team selects on release night? Only the randoms seemed to fill up. 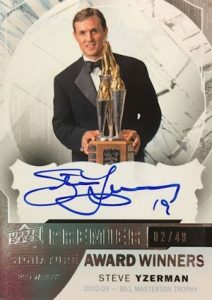 I love hockey cards & I really like some of the cards here (ie. acetate rookie patches, mega patches, etc.) so good job there UD. 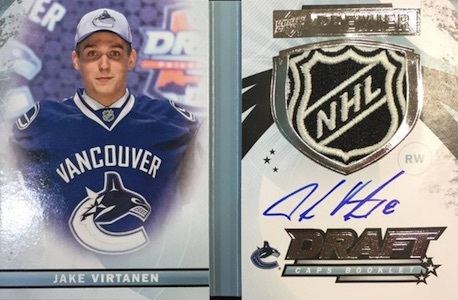 There are some absolutely deadly looking cards here but I am not sure I can afford anything other than random breaks and honestly, dropping $65 cdn/random to come away with a base card of anyone makes you re-evaluate cards in general. Next release is the CUP & based on the rumors for pricing, UD might need to choke on their remaining 15-16 products to get the point of discontent amongst us. 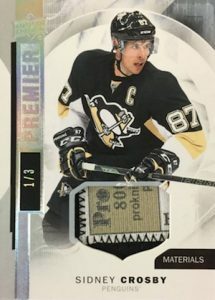 Premier, for me is definitely better looking than Ultimate by far and has the edge on UD black. The cards seem to be in better shape too. Orr auto and McDavid 5/5 in the one master I watched…Other master included McDavid patch auto /15 hat, Larkin Patch auto redem and Eichel patch /49 which was mine. I like it! 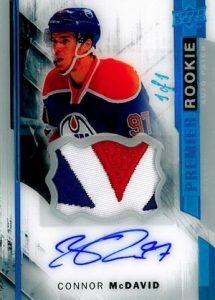 When you pull a Retro McDavid Auto Patch /49, and a Gretzky Auto /49 from 7 packs, and you still can’t break even, you know the product is a massive overpriced disaster. More than half of the cards (26/50) sold for less than $5. Product has a high end price, and delivers a multitude of low end cards. That’s been the problem of UD for a long time. High priced boxes and mostly worthless cards and poor quality control. I agree with most everyone about Upper Deck all together this year especially Premier. I shelled out $1600 cdn for an inner case and would be lucky to get $600 for all the cards pulled. End of the day you might as well just buy the cards you want off ebay and loose out on the fun of opening a pack. Over the last year on all the boxes I have opened I would give it a 50% loss which you can olnly take for so long. 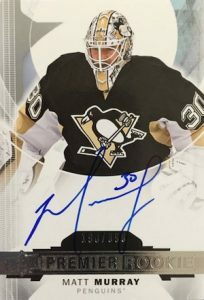 2015 16 UPPER DECK PREMIER HOCKEY HOBBY BOX - ROOKIE AUTO PATCH!